Another article on a recent keynote I did on the future of manufacturing; in this case, from The Fabricator, the publication for the Fabricators and Manufacturers Association. A chat with futurist Jim Carroll indicates that fabricators should be open to embracing technological possibilities or risk being left behind. At one time you needed a room of skilled craftsmen just to make even a simple prototype. Tomorrow it might all be done by the design engineers themselves in hours instead of days because of advanced 3-D modeling software and virtual reality technology. In helping out with some editorial preparation for The FABRICATOR’s sister magazine, Canadian Metalworking, I had the opportunity to chat with futurist Jim Carroll. (He gave the opening keynote address for the Canadian Manufacturing Technology Show on Sept. 25.) Conversations with such industry and societal observers are always interesting because they take the time to consider what may be possible in the years to come while others have their heads buried in the drudgery of everyday life. My talk with Carroll was no different, and the following three conversation highlights only promise to make those that are technology-averse even more nervous about the future. Virtual workers come to the rescue. In speaking about the advanced skills needed in modern manufacturing and the dearth of young folks interested in pursuing these types of vocational careers, Carroll mentioned how virtual technologies may be able to fill that gap. First, he discussed how he has attended vocational skills development programs, like SkillsUSA, all over the world. In fact, he made a point to reference a program in Brazil where at least 1,700 students competing in 75 categories gathered to demonstrate their advanced skills, which included welding. Second, he described how he saw people demonstrating virtual welding systems, where a dummy welding torch follows a path and advanced sensors and software replicate the welding environment even when there is no live arc. He theorized that it won’t be too long before a welder and his equipment in Brazil can be hooked up to the internet and linked to some sort of automated arm at a shop in the U.S. The overseas shop that once threatened to steal U.S. jobs because of low labor rates now has become a valuable source of hard-to-find labor. To illustrate how this type of technology is not as far off as you might think, Carroll referenced an Audi prototype delivery truck that can be driven by someone back in the office. (There’s a reason the truck has no windows!) In fact, that truck might be in Germany and driven by someone in India. Product development is reinvented. At one time you needed a room of skilled craftsmen just to make even a simple prototype. 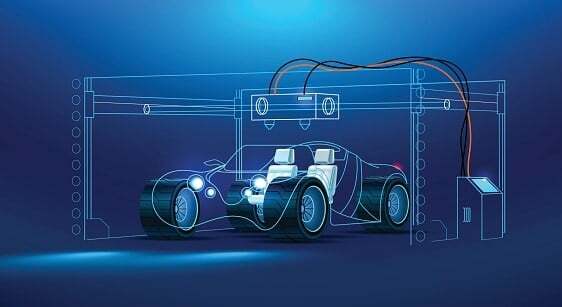 Tomorrow it might all be done by the design engineers themselves in hours instead of days because of advanced 3-D modeling software and virtual reality technology. Carroll described how Amsted Rail, a company involved in manufacturing components for railcars, which is not something normally associated with cutting-edge manufacturing, is combining video game-playing engineers and virtual reality to redefine rapid prototyping. These engineers are thrown into “Xbox” rooms, as the company calls them, to discover the best ways to combine old-school components, such as axles and wheels, with new devices such as energy management systems in next-generation undercarriage assemblies for railcars. In this environment, major design mistakes are easily forgiven, and winning designs can be fast-tracked into production. New developments in railcar components that help to save fuel and boost reliability keep the customers coming back to buy better products. Fabricators can appreciate how that might help them to secure their place as a valued supplier, which means long-term business relationships in many instances. The material of tomorrow may be a lot different than it is today. The development of metal alloys is nothing new. Fabricators have been wrestling with armor plate and high-strength steels at the press brake for years. But fabricator swon’t necessarily be working with these new materials in the same way because parts won’t need to be bent or cut. They will be 3-D printed. Already aerospace companies Boeing and Airbus are seeing 3-D printed parts that are 40 percent lighter than the traditional machined or fabricated assemblies that they are replacing, according to Carroll. Because these metal components are printed layer by layer, a designer can render complex designs that can’t be duplicated in any other way. Carroll said that new performance capabilities are possible as material scientists create new metal materials. Imagine being able to have two layers of metals seamlessly joined together when it was previously very difficult to join those materials using traditional welding technologies. Fabricators that may not want to jump into additive manufacturing at the moment shouldn’t fear, Carroll said. Like other manufacturing service providers, companies offering 3-D printing services will start to dot the landscape. They can specialize while fabricators focus on what they do best—at least until they decide to do 3-D printing. “The fascinating thing is that the future is going to unfold whether we like it or not, and it’s better if we align ourselves to it as an opportunity instead of opposing it and wishing it will go away,” Carroll said.